One of the most-frequented topics of conversation among my friends is weddings. At age 24, it seems I'm at a stage when no matter who I'm with or what we're doing, there's always something to discuss on the subject of engagement. I have yet to meet a girl who doesn't have at least some vision of what her wedding day will look like, even if she doesn't have the Pinterest board(s) to prove it. But all the Pinterest boards and dreams won't make your wedding day stress-free. When it comes down to executing on your ideas, a lot can go wrong. Learn from others' past mistakes and don't make these wedding mistakes. No matter if you're still on the market or months away from your wedding date, take note of these wedding planning tips so that your walk down the aisle will be as close to perfect as your 5 year-old self always dreamed it would be. Unless it's going to be at your or your parents' home, booking a venue is one of the first priorities when planning a wedding, since most places fill up fast. But before this can be done, you need to have a ballpark idea of how many guests will be attending your wedding, says award-winning wedding photography duo Leah and Mark. "You definitely do not want to book a venue that can’t hold everyone. And you don’t want to pay for lots of empty, unused space." Picking your bridal party can be stressful and even awkward, but don't forget that it's your day and you shouldn't feel an obligation towards anyone. "All of your friends don’t have to be in your wedding party," Leah and Mark write. The most important thing is to pick people who you want standing up with you on your wedding day — whether that means two people or ten — so take your time before you ask anyone. Traditionally, you'll ask your sisters to be bridesmaids (assuming you have any, and you're at least relatively close) and also any future sisters-in-law. Also, I'm all in favor of appointing a "man of honor" or having close guy friends in the bridal party. It's 2014, for crying out loud. There are no rules. Keep in mind that being in a bridal party can be expensive, so some people may decline your request. Sure, it's disappointing, but try to be respectful of the fact that other people have budgets. When working on the guest list, establish a clear "plus one" policy and stick to it. Yes, weddings are costly, but it's unfair to randomly pick and choose who gets to bring a date. "The general rule is that couples who are married, engaged, or living together must be invited together, even if you haven’t met your friend’s significant other," Kristen O'Gorman Klein told BridalGuide. "After that, it gets a little less clear-cut. Some couples give a plus one to singles over 18. Others decide to include dates for anyone in a relationship, while others draw the line at just couples who have been together for a year or more." When it comes to the wedding party, it's a nice gesture to allow everyone to bring a date — even for the single bridesmaids and groomsmen. You want to avoid singling out the single people. It may seem obvious, but make sure your guests receive their invitations in a timely manner. "You'd be surprised how many brides just stick a regular stamp on their invites and drop the whole batch into a mailbox," says The Knot. "The postal service will not take pity on you — your invites will be returned, rubber-stamped with that ugly 'insufficient postage' sign, and it will take at least three weeks (never mind the additional $$) to get those invitations back out the door." To avoid this, take your sealed and addressed invites to the post office, have one weighed, and take it from there. Also note that square invitations require additional postage, not only because of the weight, but the shape. Don't have your guest's address? Send them an email or text, or pick up the phone to ask for it. I recently had a wedding invitation sent to my parent's address because the bride didn't have my new address. To me, this felt a little insincere. Showers are all about celebrating with close friends and family — and also showering the bride in gifts. Inviting people to a shower who aren't invited to the wedding is tacky and can come across as a ploy to get more gifts. "The only exception is a workplace bridal shower, in which a large number of coworkers pitch in and contribute to an office celebration," Brides told readers. "If an office shower involves only a few coworkers, thoughtful couples may choose to include these colleagues in the wedding guest list." This will also make discussing wedding details at the office less awkward. Read everything. Weddings are expensive and time-consuming to plan, so it'd be a shame to be taken advantage of or be left stranded without a backup plan. "If you’re not good at reading contracts, do your best but still read them, and then also have someone who is good at reading contracts look them over," suggest Leah and Mark. "Your parents, your friends, your boss — whoever. Just make sure someone on your side has read the contract. You’re spending too much money to be signing contracts you haven’t read." Look at that fine print, ladies. I know, I know. You've got your whole wedding mapped out on Pinterest ... you and I both. "But all of its magical inspiration powers are kind of a double edged sword," writes Rachel Sandall Apple Brides. "A constant stream of ideas is great for getting you started, but it can also cause confusion and indecision if you aren’t careful." Once you've made up your mind on something, stick to it. You're always going to find new ideas, but you've got to draw the line somewhere. A girl can only handle so many DIY projects. "Pinterest can also be completely unrealistic," says Sandall. "Some of the DIY ideas (and recipes!) just plain don’t work and a lot of the things you see, especially with weddings, are from events with huge budgets. You can’t take a picture of a $500 centerpiece to your florist and ask her to recreate it for $50 ... it’s just impossible." Speaking of flowers, keep in mind that "seasonal flowers are not only less expensive, but they are easier to obtain," event planner Preston Bailey told BridalGuide. When mapping your budget, bear in mind that a good chunk of your expenses will go towards drinks. 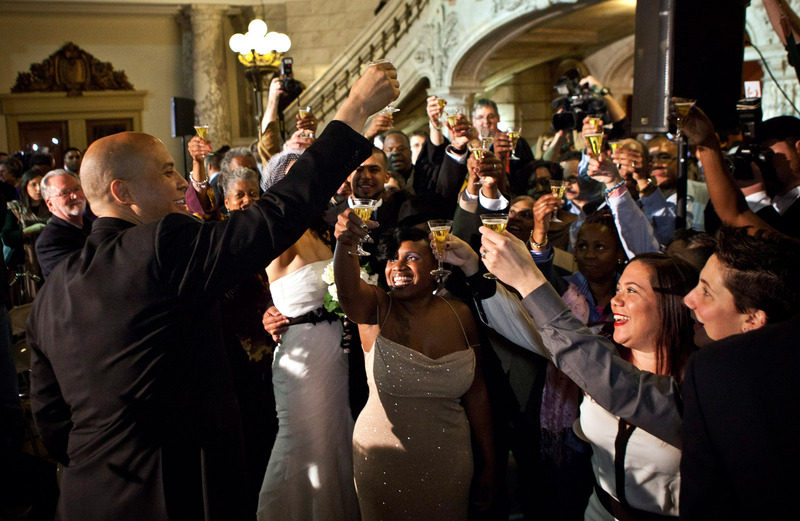 It's common practice to have an open bar during the reception, but not every couple can afford to shell out for an all-night open bar. Instead, consider the alternatives. "There are many ways to save big without having to resort to a cash bar, including serving two signature cocktails, wine, and beer, or asking your venue for a corkage option," suggests Brides . "This will allow you to keep unopened bottles which you can return, if allowed in your state." Need some inspiration for signature cocktails? Check out Pinterest or this list from The Knot. “Industry insiders agree that a five-hour reception is the tip-top of what people can enjoy and still exit laughing," wedding planner Calder Clark told Martha Stewart Weddings. "The evening should have a natural end.” You can always start an afterparty back at the hotel. Do your research on marriage licenses and figure out what the laws are in your state. "If you get your license 61 days before your wedding in Pennsylvania, you won't be able to legally marry on your wedding day, because a license is valid there for only 60 days," The Knot tells their readers. "Go to obtain your license the day before your wedding, and you may not get it in time because some states have a three-day waiting period." It shouldn't be a problem as long as you do a bit of planning. Not your first wedding? "A common mess-up for those marrying for a second time is not bringing official divorce papers when you go to get the certificate." When calculating your budget, keep in mind all of the costs that'll crop up as the big day approaches. "From last-minute seamstress charges to cash tips for deliveries, most brides wrack up hundreds in extra fees the week before the wedding," cautions Brides. A little pre-wedding planning will mitigate the financial stress. I was recently in a wedding party and, when we were on the bus traveling from the church to the reception venue, I nearly got sick all over my dress because we hadn't eaten anything for almost 10 hours. In fact, we were advised to "not stuff our faces" at breakfast so we would feel good in our dresses. But you know what? I wish I had eaten an extra bagel. Between getting ready, taking photos, the ceremony, and traveling, the day can be pretty packed. Making sure you and your wedding party are energized and happy is super important for ensuring a smooth and pleasant day. "Too many brides forget to feed themselves and the bridal party on the wedding day," Brides writes. "It's important to pre-arrange more than just nibbles for your entire crew — especially if you aren't primping in your own home. You'll want enough sustenance so you're not feeling light-headed, or faint during the ceremony." "The time spent getting ready should be as relaxed and fun as possible, but once you find yourself behind schedule the pressure can build to catch up," wedding photographer Bruce Plotkin told Brides . Do a test run and talk with your stylist beforehand to figure out how much time you and your wedding party will need on the big day. Plotkin also reminded Brides readers to resist the urge to micromanage. "While a detailed list of the day's schedule and the who's who for family portraits is essential, if you micromanage your photographer, you miss out on unplanned shots that are essential to a great album." Give your photographer some creative freedom after the formal family and wedding party photos have been taken. This will also take some stress off your plate so you can mingle with your guests, which brings me to the next point. It may seem silly, but plan how you're going to great your guests. Often, the bride and groom will stand at the end of a receiving line after the ceremony. This ensures the couple can greet all of their guests. If you want to skip straight to the reception, you might consider, instead, making the rounds while guests are seated at their tables. Whatever you decide to do, try your best to say hello to everyone and thank them for coming. This is particularly important for all of your out-of-town guests. Let them know you appreciate them making the trip to be there on your big day. Order your thank you cards before the wedding so you can start hand writing (yes, you should hand write) your notes as soon as possible. You might even consider ordering them when you order the invitations, if you want them to match. In terms of when to send out your thank you's, Brides has laid down the law: "Let's set the record straight: You do not have a year to mail your thank-you cards. Instead, for gifts received during the engagement party and shower, send a thank you within two to three weeks of the festivities; for gifts sent before the wedding date, send a card as soon as possible but definitely before the wedding; for gifts given on the wedding day itself, mail a thank-you note within three months; and for gifts received after your wedding, send one within two to three weeks." Capiche?